What I’ve learned from my journey from poverty to Yale. My 3-year-old self (left) finally realizing my dream of becoming a doctor. In 1991, my mother and I traveled from India to join my father in America with a dream of a better life. However, soon after our arrival in the U.S., my father lost his job as a factory worker. We fell into poverty. My parents then divorced, and I have seldom seen my father since. One thing I learned growing up poor, especially with only one parent, is that it is painful. Yes, it’s hard to purchase what you might want — or need. There are times your stomach hurts, because it is empty. But there is also a stress to it all. The stress of living on the edge, hand-to-mouth. The fear that if something goes wrong, you’d be bankrupt — not just of money, but of hope. I’ve realized that people who have financial means are privileged precisely because they don’t feel that pain — and have likely never felt it before. That’s why Social Services programs were essential for us. Food stamps, Section 8 housing, Medicaid, WIC, Head Start, and more. These programs were our lifeline. They helped us cope with the pain. Without government health insurance, for example, I would never have met Dr. Falk. Not only my pediatrician and a father figure, he was my inspiration to be a doctor when I grew up. With Social Services sustaining us, my Mom worked multiple jobs — cashier, bank teller, daycare center worker — while pursuing her teaching certificate at local colleges. It was hard, but with time she became a teacher and we gradually moved out of poverty. My childhood taught me that it is difficult to survive and escape poverty without help. We should not be cutting down on these government programs, but rather should be investing in developing further supports to enable folks to escape circumstances that many didn’t choose. I had a dream, but how could I achieve it? I knew that education was the only path I had to make my dream of becoming a doctor come true. I attended inner-city public schools in New Haven, Connecticut, but my schools had limited resources, and I questioned whether I would be able to succeed. My teachers were there to help, starting with Mrs. Neighbors. A petite African American woman with her grey hair pulled back in a bun, she was my biology teacher. I shared my dream with her, and she helped to make it a reality. She encouraged me, and introduced me to science and medicine programs at Yale School of Medicine. I took advantage of these opportunities and worked my tail off. With the support of my mom, teachers, and classmates, I graduated valedictorian of my high school and was admitted to Yale College, something quite improbable when I first arrived in America. Public schools are not perfect. That we all know. But they are an important gateway to higher education — and a better life — for millions of Americans. They provide opportunities for kids to escape unfortunate situations. Moreover, my schools, filled with a diversity of students, were a microcosm of America herself; as an immigrant, they helped me feel I belonged. And they are home to teachers who care. In many ways, for me the rest is history. I graduated from college and am now a medical student at Yale School of Medicine. As a scientist, I am studying our healthcare system and working to make it better for every person, particularly those in disadvantaged positions. Towards this end, I have investigated healthcare for our nation’s veterans and the elderly in Medicare. It is surreal; I am pretty much living my dream. Yet, more than Social Services and public schools, the most important thing along this journey was the assistance we received from everyday Americans. Without them I would not be here. Take James. A grizzled U.S. Air Force veteran, he was one of our main supports. James stood up for us when things were difficult with my father. He also filled a void. With the rest of our family on the other side of the world, he provided the counsel and friendship we longed for. When he passed away, he left us $5000, which helped us buy our first home. More than anything else, my life has taught me that it’s the American people that make America Great. Folks like James, ordinary people who, through selfless acts of kindness, support their fellow Americans when they need it most. They provide help — and hope. These are real Americans. And the greatest privilege of my life is to be one of them. 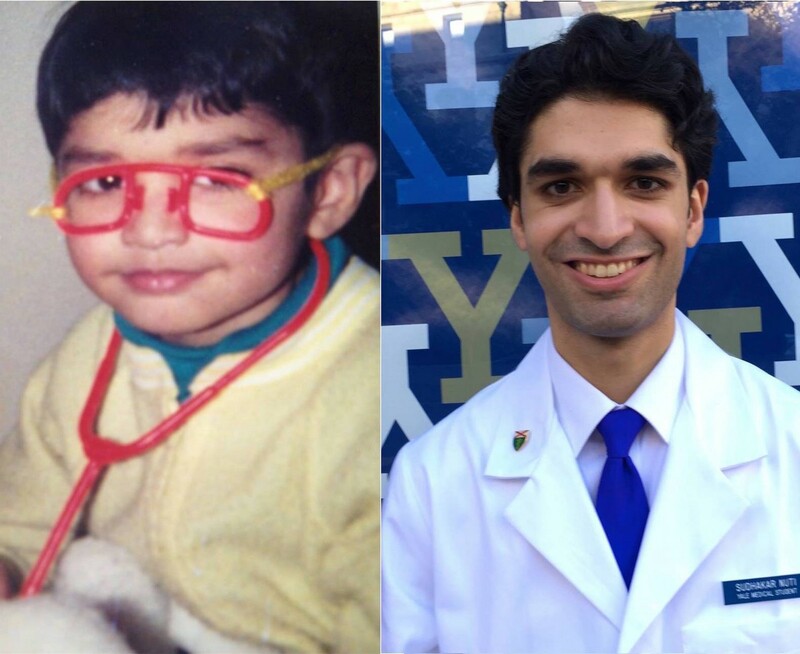 Sudhakar Nuti is a student at the Yale School of Medicine, one of Forbes’ “30 Under 30” in Healthcare, and became an American citizen in 1999.